I saw this picture of some Hostess cupcakes on Tumblr awhile ago and figured I'd better make a raw and vegan version because... why not. Although I never ate the infamous baked treats before I became vegan, their imagery still managed to infiltrate my eyesight; good marketing does that. 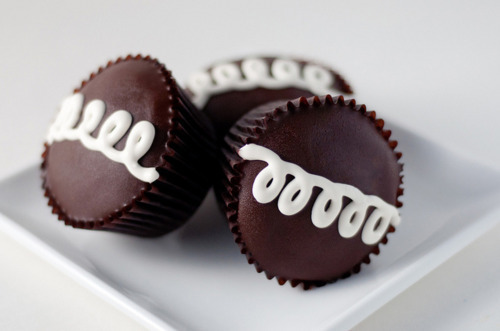 If you're not familiar with what I am talking about, Hostess cupcakes are just chocolate cupcakes filled with a vanilla cream, and topped off with chocolate frosting and an endearing little swirl of the vanilla cream. Sadly, they're full of all the crappiest-quality ingredients you could possibly put together. Seriously - no one is living longer or fighting cancer by eating these guys. Fortunately, apart from their appearance, this recipe is the exact opposite, plus it probably tastes better (I'm a little biased though). The ingredients include dates, oats, cashews, coconut oil and cacao powder. Google any of those and you will see that they are all excellent for you. Hehehe. Sometimes it feels like the world is almost too good to us. Here's a run down of the recipe: the cupcake part is made up of oats, date and cacao powder; the vanilla cream filling is mostly cashews and coconut oil; and the chocolate frosting is cacao powder, almond butter and whatever sweetener you like. My frosting skills are lacking, as you can tell by the pathetic swirls I failed at creating. I had to use a hoisin sauce bottle, okay? No fancy piping bags in THIS kitchen, we do it thrifty-style. Of course, it doesn't actually matter what your swirls look like, since they're all gonna taste equally delicious and wholesome. When I made these they were very sweet and rich (almost too much so, and for me that is saying a LOT) so in the recipe I typed up here, I lessened the amounts of sweeteners. But as always: you can - and should - adjust the recipe to suit your tastes/available ingredients/whatever. Note: you will have leftover vanilla cashew cream... I assume this will not be a problem. To make the cupcakes: pulse the oats in a food processor until they become flour-like. Add the rest of the ingredients and process until it all sticks together. Press into lined cupcake tins and indent a thumbprint in the middle of each one for the vanilla cream. Put in the fridge. To make the vanilla cream: blend all the ingredients together until smooth. Scoop a spoonful into each of the indents you made in the cupcakes. You'll have lots left over. Put the cupcakes back in the fridge. To make the chocolate frosting: mix together all the ingredients until smooth. Let it re-solidify just enough so that you have a frosting consistency. Frost the top of the cupcakes and then using a piping bag, decorate the tops of your cupcakes with the vanilla cream. Eat right away or within 1-2 weeks. This looks AMAZING, Emily, thank you! I have a son who is allergic to nuts (big time allergy to peanuts, and lesser allergy to tree nuts, but we avoid them completely just the same). My question is - is there anything you can suggest as a substitute for nuts in the cashew vanilla cream? I know that's a tall order, but would love to make some of these amazing recipes for him to enjoy, so would appreciate any help you can provide - thank you! Yeah! Blend up a couple bananas with dates and vanilla :) It's like banana vanilla pudding!! or follow this persons advice: "Use coconut butter and fresh coconut flesh with a bit of coconut oil and agave syrup :) that should do the trick! Refrigerate until it has firmed up." Yum! These look like a rawsome version of the original ;) Pinned! Girl I think you may have outdone yourself. These look so good! And no, leftover cashew cream is never, ever a problem. Looks amazing :) .... but I don't think oats are raw? Thanks for your reply Emily. I have never seen raw oats, I called one company and then said all oats have to be steamed. If you know of a raw brand please let me know. Otherwise I will try your other suggestions. Thanks! I'd soak them, dehydrate them, then turn them into flour in your blender. Mmm. Looks good! How many cupcakes does the recipe make? they look SO good. hmm you mention almond butter in the chocolate frosting but it's not listed below in the ingredients list. would it be better with or without? I made these for breakfast, yum! I ended up adding a little bit of water to the oat/dates/cacao mixture to help it stick together, maybe my dates were a little dry. My cashew cream filling ended up tasting a little more cheesecake-like than cream, I used 2 T of lemon juice, the only change for me is next time is that I'll use a little less lemon. These are awesome and easy to make! These look so delicious my wife is going to make these over the weekend for us! Hey! The look so amazing and I wanna make them!!! One question, when a recipe calls for dates and doesn't specify, whether it be medjool, snack or pitted (sorta dried?) which ones are required? Hey your website is amazing! Can I use gluten free oat meal for a replacement for the oats? Hi! I wanted to know if the cashews supposed to be soaked first? A lot of the recipes involving cashews in dessert involve them being soaked so I don't know if you just forgot to say that in this recipe. Thank you!! These were fabulous. I changed it up a tad, however. I added more lemon to the cashew cheese (I love that tart lemon flavor like you get from lemon pies, etc). Then I skipped making the frosting and used the cashew cheese as the frosting. Yummy! These just HAVE to be made in my house! I don't have coconut nectar, so can I use maple syrup instead and get a similar result? Regarding the oats, I still feel confused about the whole issue of whether it's okay to eat oats raw or not. Some people say it's really bad not to soak them first, others say it's fine not to. What I have in the house is organic rolled oats. Are these okay to use raw in this recipe (feel like I have an oat comprehension problem where the raw vegan diet is concerned, LOL). Thanks!! @Shyami Nazzaro- maple syrup is fine :) Those are fine to use as is! Can the oats be substituted with anything else?